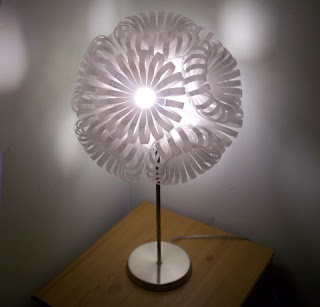 These recycled water bottle lampshades are a terrific use for used water bottles. Even more cool is that you make them yourself. Search around the web and you'll see plenty of do it yourself instructions. That said however, the lovely table lamp to the left is from UK designer Sarah Turner and is made from 10 coca cola bottles (500 ml. size). These "eco-sneaks" from Simple shoes are the ultimate in green design for shoes. Comfy as well as stylish and oh so eco!. 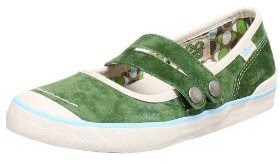 i happen to love the MJ (that's Mary Jane) style and I adore this color green, but Simple Shoes has lots of styles to choose from. 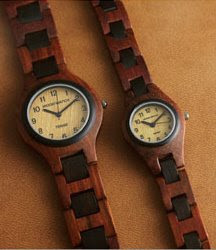 The case, face, and band of this beautiful, luxurious, and unique looking wristwatch are crafted from sandalwood from managed tree plantations. Quartz movement from Japan. Adjustable links. Men's watch measures 1.25 in. ; Women's measures 5/8 in.